James Grage’s food philosophy is pretty straightforward: you get out of your body what you put in it. He eats clean, healthy meals that work for him. No cookie-cutter diets here. James Grage's nutrition falls in line with his training philosophy. When it comes down to it, sustainability is key. 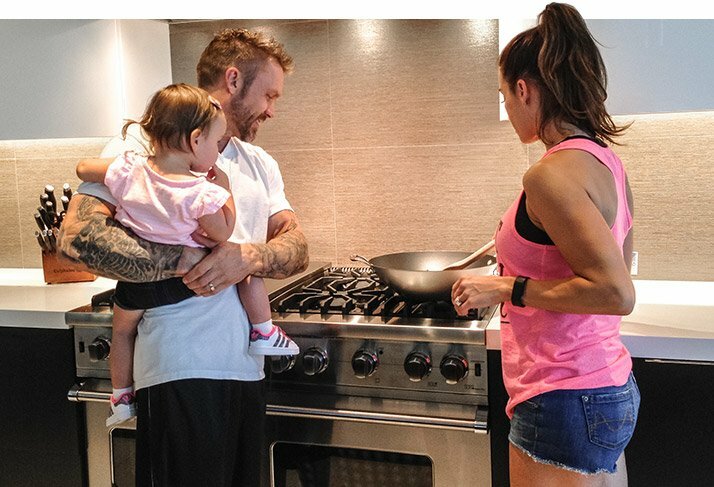 Instead of following a trend diet that completely eliminates carbs, focuses only on protein, or restricts all sugar, James aims for well-rounded meals that mesh with his busy lifestyle. As long as James doesn't feel like he's sacrificing anything, and keeps his meals healthy and delicious, he can make healthy eating a lifelong choice. It's essential to his success. Learn more about James' whole foods philosophy! If you ask James, processed foods have no place in your diet. He's all about whole foods, lean protein, and veggies. The fewer additives, the better. "I try to eat a well-rounded meal and keep it to four ingredients," James says. "If there are more than four ingredients on the plate, it's usually too much. It's not like I'm on some sort of big organic kick, I just believe that what you put in your body makes a difference." Chicken, turkey, fish, and morning egg whites make up a good portion of James' protein sources. Oatmeal, brown rice, and quinoa make up some of his complex carbs. Still, clean eating isn't always easy. "Honestly, if I had my choice, I wouldn't eat vegetables," James says. "I eat them because they're healthy and I know I should and I'm trying to set a good example for my son." You could have the cleanest muscle-building meal plan on paper but, if it's not implemented, what good is it? "There's not one cookie-cutter diet that's going to work for everybody," James says. "Something could be very successful, it could be the best diet in the world, but if you can't maintain it and you don't like doing it, then it's not the right diet for you." His advice: Find something you can stick with. For James, that means that an occasional cheat meal is allowed. "I try to keep it reasonable clean and then, once a week or every other week, I'll have a nice dinner with my wife and my kids and order whatever I want off the menu." James doesn't only eat healthy for himself. He eats healthy for his family, too. "I have two kids and a wife, and I want to be around for a long time and enjoy that time with them," James says. Having grown up in a home where health and fitness were valued, James knows the importance of having good examples—especially when it comes to nutrition. "As a parent, I take my job very seriously," he says. "You're responsible for shaping who these kids turn out to be. You try to educate them on nutrition, health, and fitness in general. When they grow up maybe they'll be into it and maybe they won't, but at least they'll be able to make that choice for themselves." Blend all ingredients into a thin batter. Note that it will look much thinner than a regular pancake batter. Preheat pan on medium/low heat. Cover pan with a lid when cooking. Flip once you see the edges dry slightly. I prefer to eat mine plain, but you can add a sugar-free syrup or sugar free jam for a low-calorie topping.